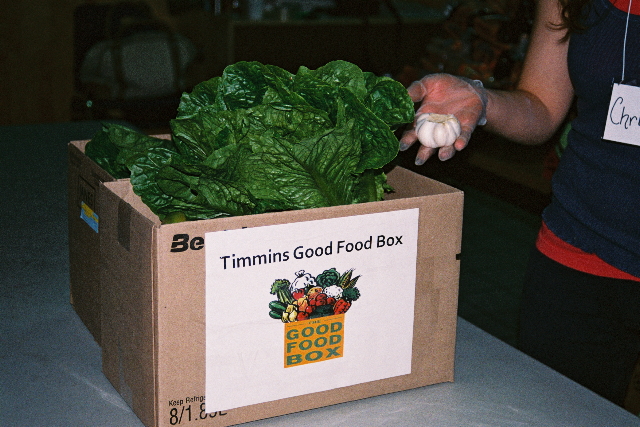 The Timmins Good Food Box program (GFB) is a community based food distribution program designed to make good food more accessible! The GFB works like a buying club – customers pool resources and save money by buying bulk. Each Good Food Box contains a variety of veggies and fruits that change each month and includes a bilingual newsletter with nutritional information and recipes. Customers place their order by the first Thursday of each month by signing up at one of our host sites located throughout the city or by placing an order online (online ordering available soon). Large boxes are $20 and Small boxes are $12. There are no restrictions on who can purchase either box. The Large box contains 8-10 items, and is ideal for 3-4 people. The Small box contains 5-8 items, and is ideal for 1-2 people. Savings, of course! Customers typically save 25-30% from their purchases. Convenience: with 15 private and public host sites located throughout the city, a host site might very well be closer to you than your nearest grocery store. Variety: The variety of fruits and vegetables in the boxes changes month by month, depending on what is available from our suppliers. Information: Each Good Food Box includes a bilingual newsletter that contains fun facts, storage and nutritional information, as well as a recipe for a featured food item. A green conscience: We work with local farmers to bring you seasonal and local foods that travel fewer food miles from field to table. 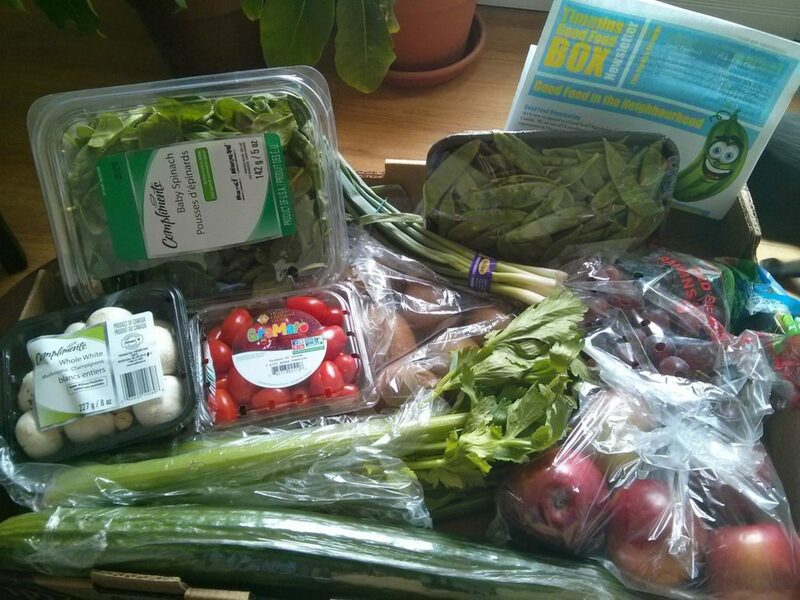 Purchasing decisions for the Good Food Box are made based on quality, value, variety, source proximity and season. Gift certificates are available for both Large Box and Small Box sizes..
A host site is where orders are placed (if not placing online), and where boxes are picked-up. Take a gander at all of our public host sites to see which one is closest to you! We’re looking to expand our network of host sites to Schumacher as well as underserviced areas such as trailer parks. If you are interested in becoming a host site please get in touch with us! For more information on the Good Food Box Program, please contact the Coordinator at 705-262-2499 OR Click Here To Purchase ONLINE!